In many ways, a motorcycle accident personal injury case is like any other motor vehicle collision case. If your injuries were caused by another driver’s negligence, you are entitled to certain types of damages. Motorcycle accident cases are different from your average two-car collision in that, for obvious reasons, the injuries are frequently more severe. Motorcycle accident injuries are often permanent and can lead to life-long health and financial difficulties. As a result, it is critical that if you are injured in a motorcycle accident you contact a knowledgeable personal injury attorney to look out for your interests. The motorcycle accident lawyers of Maginnis Law, PLLC offer free evaluations of personal injury cases and may be reached at 919.480.8526. You may also submit a new case inquiry using our contact page. Another way in which motorcycle accident cases are different from an average two-car collision is that they tend to involve several applicable insurance policies. For instance, if you are injured while riding your motorcycle and your attorney can prove your damages exceed the liability limits provided by the at-fault driver’s automobile insurance policy, then you may seek to recover personal injury compensation from the underinsured motorist insurance (UIM) provided in your own motorcycle and automobile policies. The UIM provisions in those policies will “stack,” likely allowing an additional recovery beyond the at-fault driver’s policy. The civil litigation lawyers of Maginnis Law, PLLC will review your exact insurance coverage situation with you during your free consultation. If you can successfully prove the negligence of the at-fault driver, the following damages are available in your motorcycle accident personal injury case: (1) medical expenses; (2) lost wages and/or wage earning capacity; (3) physical, mental, and emotional pain and suffering; (4) property damage; (5) temporary and/or permanent disability; (6) permanent scarring and disfigurement; and (7) punitive damages when the defendant’s conduct is gross or willful and wanton (such as driving while intoxicated). Maginnis Law, PLLC represents injured motorcyclists on a contingency basis. You pay no attorneys’ fees until you recover compensation for your injuries. 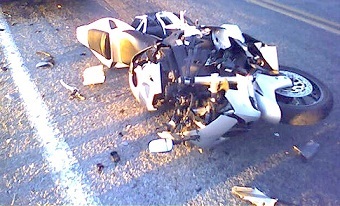 Our motorcycle accident attorneys also offer free consultations for all personal injury cases. If your injuries have left you unable to travel, our attorneys will travel to meet with you. You may reach the motorcycle accident attorneys of Maginnis Law at 919.480.8526, or you may submit a new case inquiry using our contact page. Our civil litigation lawyers handle motorcycle accident cases from Raleigh, Durham, Chapel Hill, Cary, Morrisville, Apex, Wake Forest, Clayton, and the surrounding Triangle area.